Item is a photograph of Mr. Williston completing 500 miles in his personal centennial project of running the equivalent of the distance to Prince George. 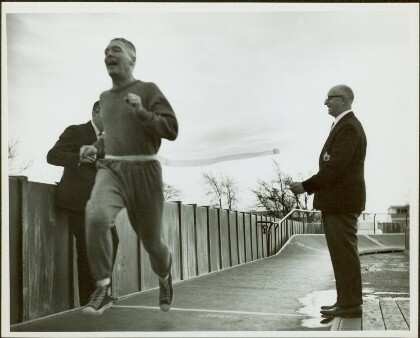 The run took place on the YMCA track in Victoria. Published in 1997 in “Forests, power and policy: the legacy of Ray Williston” by Eileen Williston and Betty Keller.